Neck pain is a common sensation in our society, where we spend much of our days slouched at the computer or bending over a mobile phone. For these reasons, neck pain may develop on its own, or in conjunction with tension headache and migraine. More serious causes of neck pain include injury – whiplash, sprain or strain for instance – and disorders such as fibromyalgia, or age-related disease like arthritis and cervical spondylosis. Neck pain can manifest in different ways, depending on the person and the cause. Turning your head could be difficult due to stiffness, or could result in sharp, stabbing pains. The muscle and tissue around the top of the spine could be sore and tender, and this pain might extend beyond the immediate area, radiating down the shoulders to the arms and fingers, or up into the head. More serious conditions can lead to radiating tingling or numbness, difficulty gripping objects with the hand, or even trouble walking and balancing. As these symptoms show, neck pain can range from minor and manageable – you’re still able to go about your day and complete your routine – to more serious and debilitating, interfering with regular activities and making it hard to sleep. Neck pain may be categorized as acute – the pain comes on suddenly and lasts a few months at most – or chronic, wherein the pain slowly worsens over time, and either persists for more than a few months, or comes and goes in “flare-ups”. Like any muscle or joint, mild pain in the neck can usually be alleviated with properly supported rest, heat and ice, and massage. If the pain is recurring, a doctor will likely recommend changes to the individual’s lifestyle (less time at the desk or bending over your phone, improved posture), and may prescribe an over-the-counter medication such as a muscle relaxant or anti-inflammatory painkiller like ibuprofen. If these basic treatments do not provide the necessary pain relief, more extreme measures may be taken. Physical therapy can replenish the strength and proper sensation, and prescription medications such as NSAIDs (nonsteroidal anti-inflammatory drugs) and opioids can dampen pain; if necessary, cervical epidural steroidal injections may be used to provide relief. For people looking for a more natural alternative to extended use of over-the-counter painkillers and opioids, cannabis can provide immeasurable relief. 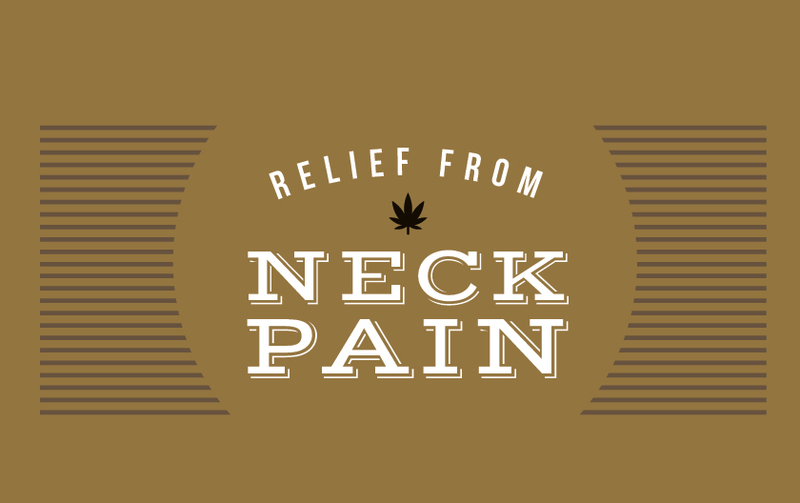 One of the major ways cannabis can help alleviate neck pain is by relaxing the painful spasms that often shoot through a kinked-up neck. The plant’s intense relaxing effect has had proven effect on the seized muscles of individuals with multiple sclerosis and epilepsy. Cannabis can also reduce inflammation in the tissues, reducing pressure and pain. While some individuals find they can completely cease use of pharmaceuticals once they begin cannabis treatment, that isn’t always the case. But even supplementing your doctor-prescribed medication with cannabis products can make a positive difference. You will be able to cut back on the former, which, in the case of opioid drugs, have many dangerous side effects including the potential for addiction and over-dose. In addition to easing the pain itself, cannabis can help you manage the side effects of severe long-term pain, like dizziness and nausea. When it comes to joint and muscle issues, cannabis topicals are the star of the show. Though most often recommended for chronic pain, topicals may help with temporary neck problems as well, alleviating stiffness and pain, and promoting relaxation. Essential oils often added to the balm or salve can provide further relief. If you’re seeking cannabis purely for its therapeutic benefits and would prefer not to feel the well-known psychoactive side effect, topicals are precisely the treatment you need. Whether the ointment is made with THC (a natural, psychoactive compound) or CBD (a natural, non-psychoactive compound), when absorbed through the skin, no mental effects are felt. And because the neck is an accessible area, you can easily administer a balm to the problem spots without further wrenching your body. Whatever type of cannabis treatment you choose, if you’re taking pharmaceuticals always let your doctor know you’ve decided to use cannabis as well. Knowing this, your doctor is likely to prescribe a lower dose of the prescription medicine. At FARM we stock Earth Dragon balms, which combine muscle pain and inflammation relief with relaxing aromatherapy scents like eucalyptus and clary sage. FARM’s own balms can relieve neck pain and double as a treatment for skin irritations and headaches, and our bath salts soothe away pain and stress. If our balms and topical products are not strong enough by themselves, we recommend combining them with our impressive array of flower, in order to achieve maximum treatment effects from cannabis.